Michelle graduated with her Master’s degree in Social Work from Newman University in 2017. Michelle has worked with a variety of clients including adolescents, teens, adults, and couples who have experienced many mental health issues. Michelle is clinically licensed and had experience working with clients who are struggling with symptoms of severe depression, suicidal ideation, anxiety, panic attacks, anger, PTSD, C-PTSD, sexual abuse, divorce, grief, gay/lesbian issues, transgender, and marriage issues. Michelle utilizes a variety of evidence based practices and has specific training including Eye Movement Desensitization and Reprocessing (EMDR) to treat clients who have experienced trauma, Emotionally Focused Therapy (EFT) for couples trying to regain communication with each other, or heal from an affair, as well as Cognitive Behavior Therapy (CBT). Michelle utilizes play and art projects with children and teens to make therapy more fun. 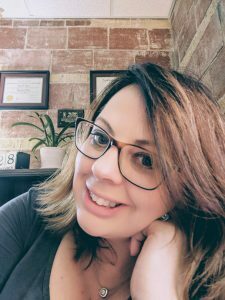 Michelle is a very empathetic therapist that has a kind way of truly connecting with her clients to make therapy as comfortable as possible for those seeking help.